Before 1737: he starts his career on Ôsaka stages, as a disciple of Tomizawa Montarô I; his first stage name is Tomizawa Tsuneyo. 1737: he is adopted by Sanogawa Hanazuma I and his stage name becomes Sanogawa Tsuneyo. 11th lunar month of 1737: Tsuneyo plays at the Naka no Shibai the role of the keisei Matsukaze in the kaomise drama "Fukakusa-no-In Sannô no Maki", which is produced by Nakayama Shinkurô I. 1739: his adoptive father Sanogawa Hanazuma I retires. 11th lunar month of 1739: Sanogawa Tsuneyo takes the name of Sanogawa Hanazuma II and becomes zamoto in Ôsaka at the Naka no Shibai, where he produces the kaomise drama "Fûryû Gozen Kabuki". 11th lunar month of 1740: Hanazuma produces at the Naka no Shibai the kaomise drama "Shinra Genji Shimada Gunpô"; his stage partners are Ôtani Hiroji I, Anegawa Shinshirô I, Arashi Sanjûrô II, Iwai Hanshirô III, Yamatoyama Jinzaemon II, Fujikawa Heikurô, Kamakura Heikurô I, Tomizawa Montarô I, Yoshizawa Ayame II and Yoshizawa Sakinosuke II. 11th lunar month of 1744: Hanazuma performs in Kyôto at Miyako Mandayû's theater in the kaomise drama "Hakata Ori Imose no Karanishiki"; his stage partners are Fujioka Daikichi, Tamiya Shirogorô, Sawamura Chôshirô, Sadoshima Chôgorô I, Matsumoto Tomojûrô I, Nakamura Danzô, Tatsuoka Hisagiku, Mihogi Gizaemon I, Sakakiyama Danshirô I, Takenaka Hyôkichi, Ikushima Kashiwagi I, Nakamura Matsubê I, Nakamura Kiyosaburô I and Fujioka Gengorô. 11th lunar month of 1745: Hanazuma performs in Kyôto at the Kitagawa no Shibai in the kaomise drama "Kachidoki Manzairaku", which is produced by Nakamura Kiyosaburô I for the nadai Miyako Handayû. 1st lunar month of 1746: Hanazuma plays in the same theater the role of Otoku in the drama "Matahei". His stage partners are Anegawa Shinshirô I (Matahei), Anegawa Daikichi I (Nagoya Sanza), Nakamura Utaemon I (Fuwa Banzaemon) and Nakamura Kiyosaburô I (the courtesan Tôyama). 11th lunar month of 1747: Hanazuma performs in the kaomise drama "Teikin Ôrai Manzoku Kagami", which is produced by Nakamura Matsubê I at the Kitagawa no Shibai and celebrates the shûmei of Sakakiyama Kôshirô II and his son Sakakiyama Shirotarô II. Others stage partners are Yamashita Matatarô I, Takenaka Heikichi, Fujioka Daikichi, Nakamura Kiyosaburô I, Nakamura Shirogorô III, Kasaya Matakurô I, Asao Motogorô I and Fujikawa Heikurô. 11th lunar month of 1748: Hanazuma performs at Hoteiya Umenojô's theater in the kaomise drama "Sugamori Hiru-ga-Kojima", which is produced by Arashi San'emon IV; his stage partners are Nakamura Tomijûrô I, Yamashita Matatarô I, Sakurayama Shirosaburô II, Hanakawa Ichinojô, Fujikawa Heikurô and Imamura Shichisaburô II. 11th lunar month of 1749: Hanazuma plays at Ebisuya Kichirôbê's theater the role of Sagoemon's sister Miyagino in the kaomise drama "Tokitsukazeyasu Keizu", which is produced by Sakakiyama Shirotarô II. 1st lunar month of 1750: Hanazuma's rank in the Kyôto hyôbanki, wakaonnagata section, is jô-jô-(shiro)kichi (superior - superior - (white) excellent). 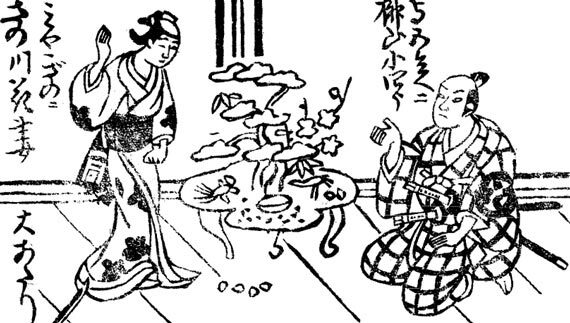 11th lunar month of 1750: Hanazuma plays in Kyôto the role of Yajirô's wife Osono in Matsuya Raisuke I's kaomise drama "Kaikei Wagô Hanayakata", which is produced by Miyako Handayû. 1st lunar month of 1751: Hanazuma's rank in the Kyôto hyôbanki, wakaonnagata section, falls to jô-jô-hankichi (superior - superior - half excellent). First Kabuki adaptation of the puppet theater drama "Tamamo-no-Mae Asahi no Tamoto", which is produced in Kyôto by Miyako Handayû at his theater; Hanazuma plays the roles of Jûsaku's wife Osetsu and Princess Katsura [casting]. Fall 1751: Hanazuma and Fujikawa Heikurô go to Edo. 11th lunar month of 1751: Hanazuma plays at the Nakamuraza the role of Shirotae in the kaomise drama "Honryô Hachinoki-zome". 1st lunar month of 1752: Hanazuma's rank in the Edo hyôbanki, wakaonnagata section, is jô-jô-(hanshiro)kichi (superior - superior - almost excellent). He shares the same rank with Nakamura Kumetarô I. Fall 1753: Hanazuma goes back to Ôsaka. 11th lunar month of 1753: Hanazuma plays at the Ônishi no Shibai the role of Karahana in the kaomise drama "Taihei Kiso Monogatari". 1st lunar month of 1754: Hanazuma's rank in the Ôsaka hyôbanki, wakaonnagata section, is one black stroke above jô-jô-(shiro)kichi (superior - superior - (white) excellent) [visual]. 1st lunar month of 1755: Hanazuma's rank in the Ôsaka hyôbanki, wakaonnagata section, falls to jô-jô-hankichi (superior - superior - half excellent). 11th lunar month of 1757: Hanazuma plays at the Ônishi no Shibai the role of Otake in the kaomise drama "Shiki Sanban Okina Kagami"; this is most likely his final stage appearance as he falls ill and quickkly retires from the Kabuki world. The onnagata actor Sanogawa Hanazuma II was active in Kamigata from the 1730s to the end of the 1750s. He did not reach the prestigious jô-jô-kichi but he was close to get it during his short stay in Edo at the beginning of the 1750s. He died in 1762.